Ballymena United manager David Jeffrey. Pic by PressEye. 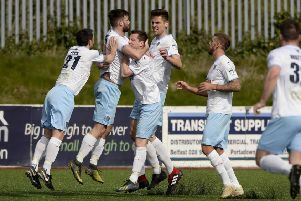 Ballymena United will be aiming to bounce back from last week’s derby disappointment when they take on Dungannon Swifts. However, boss David Jeffrey knows his side will face a tough task at Stangmore Park on Saturday against a Swifts side who are unbeaten in their last three games. Dungannon Swifts manager Rodney McAree. Pic by PressEye Ltd. The Sky Blues slipped to a 2-0 defeat to old foes Coleraine last weekend - and Jeffrey knows they will have to improve to get anything from Rodney McAree’s side. “I watched Dungannon against Glenavon last Friday night and they were very impressive,” he said. “They were thoroughly deserving of their point, and on another day they could have taken all three. “They play a great brand of football and Rodney McAree has put together a great side down there. “It is going to be very tough for us going up there next, but I’ve said to the players, while we are disappointed with Saturday’s result, we have to put it to bed. “The frustrating thing was we were on a good run, playing well. “Then you have a day like Saturday when you think we’re really going to go out and carry it on but, bang, you fall flat on your face. The Sky Blues are still without several key players due to injury, but they were boosted by the return to training of striker Johnny McMurray. The front man was put through his paces before last week’s derby game and is edging closer to a return to action. That will be a big boost to Jeffrey, who is down to the bare bones at present. “We had 17 fit players last Saturday and Joseph McKinney was a doubt prior to the game,” he said. “That’s why we brought him off at that stage. On the pitch the United boss knows his side need to start defending better. The two goals the conceded to Coleraine last week were more than preventable, which irked Jeffrey as he watched on from the sidelines. “The frustrating thing is even though Coleraine were better than us, the two goals were from a free-kick we shouldn’t have given away and then we didn’t defend it properly,” he said. “We actually worked on that last Tuesday and Thursday night, and we also had video information for the players. “But you can’t legislate when players don’t go and pick up their man. “Ironically, we weren’t done from open play, it was two free-kicks. While Ballymena’s form has been up and down, Dungannon Swifts have been steadily building a platform for themselves. Draws away at Crusaders and Glenavon have been a major boost for McAree and his players, who are now within touching distance of the top six. “Yes we have been doing well,” said McAree. “We have won five, drawn two and lost one of our last eight games. “And we have to take a wee bit of belief out of our last two results and take that into our next match against Ballymena United. “I think we fully deserved a point at Mourneview Park. “If you look at the first half, we got into good areas and we looked a threat and a force. “We got in behind Glenavon in the first 25 minutes a number of times but we did not make enough of those opportunities and we have to be more clinical in front of goal. “Paul McElroy has done exceptionally well for us and he has done really well in our last two games.